Wondering how many votes the various statewide and congressional candidates received in your neighborhood in the 2018 elections? We can help. 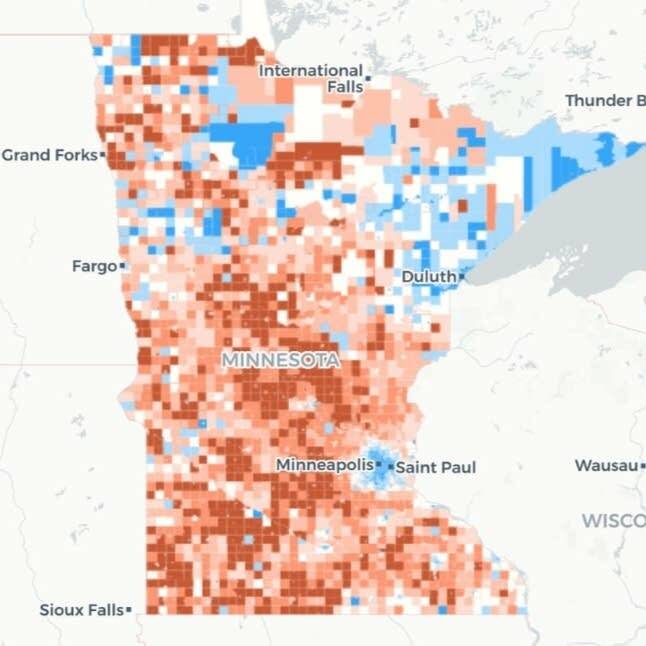 Try this MPR News mapping tool that lets you search vote totals by precinct across Minnesota for last week's statewide and congressional elections. Precincts with more votes for a DFL candidate are in blue and others with more votes for a Republican in red. The darker the color, the greater the percentage of votes a candidate obtained. To get more details, you can zoom in, hover over or click each precinct on the map. Click the office names below to view each map. Give it a try. Note: This map is based on the unofficial results of the 2018 general election from the Minnesota Secretary of State. Precincts with no vote may be a mail-in only precinct or a precinct with no registered voters residing, according to the secretary of state.